STED Microscopy (Stimulated Emission Depletion Microscopy) was invented by a group of researchers from the Max Planck Institute of Biophysical Chemistry in Göttingen and the German Cancer Research Institute in Heidelberg, for which they won the 2014 Nobel Prize for Chemistry. STED – a super-resolution technique that resolves adjacent objects beyond the diffraction barrier of visible light, has been embodied into a small number of commercial instruments, but the original patents are held by the founders of our partner, Abberior Instruments, and their STEDYCON and Expert line are now sold and supported by Photon Lines Ltd. 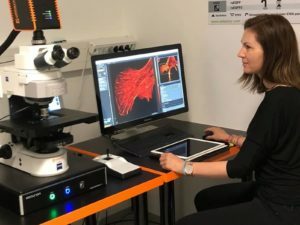 Although Abberior Instruments has long been associated with an ability to customise its flexible STED microscope platform, its recent development, STEDYCON is an innovative, shoebox-sized solution for STED and confocal microscopy. 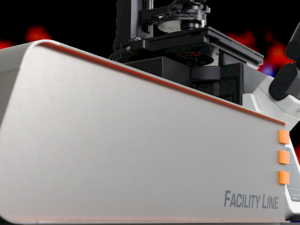 As an add-on it converts any conventional epifluorescence microscope into a powerful multicolour confocal (405nm, 488nm, 561nm, 640nm) and STED (775nm) system, which fits perfectly with Photon Lines’ complementary line of microscope add-ons. This is a completely new class of nanoscope. In contrast to standard microscopes, in the STEDYCON the easySTED optical arrangement ensures that all laser beams are aligned by design, making re-aligment procedures a thing of the past. It proves that top-notch super-resolution can be provided in a robust, affordable and easy-to-use way.